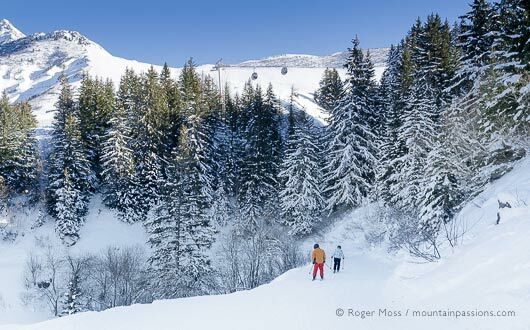 Unless you’re a keen skier the Beaufortain may not sound instantly familiar, but this tiny area of Savoie, tucked away in peaceful deep valley between Albertville and Mont-Blanc, is without doubt one of the most beautiful corners of France. 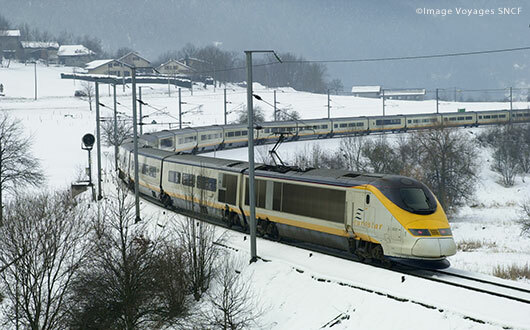 It’s hardly the kind of place that you’ll stumble upon by chance unless, like me, you decide to follow the legendary Route des Grandes Alpes, or happen to be on a quest for one particular Alpine delicacy. Beaufort-sur-Doron is the spiritual home of Beaufort cheese, but feels more like a village, with a resident population roughly equal to that of the dairy cattle who graze the surrounding pastures. …there’s simply nothing to compare with the complex flavours of cheeses created on the mountains themselves by a handful of artisan producers. Today Beaufort enjoys something approaching global celebrity among lovers of the nutty, Gruyère-style cheese which in 1968 received the coveted AOC (Apellation d’Origine Controlée) status. AOC accreditation assures the quality and authenticity of the product, as well as its place of origin – if the label says ‘Beaufort’ then buyers can be assured that it can only have come from right here in the very heart of the Beaufortain. 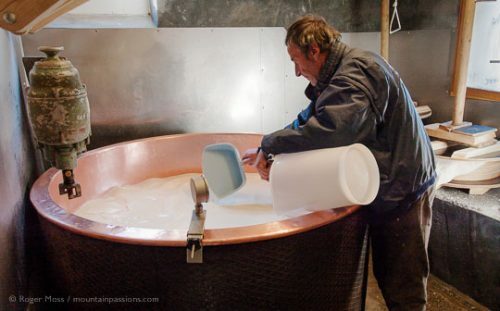 Most of the annual output of Beaufort cheese is produced and matured (‘affiné’) using traditional methods in Beaufort-sur-Doron’s imposing Laiterie Co-Operative, which represents around 130 local dairy farmers and creates a range of cheeses (also available for visitors to purchase). The most demanding connoisseurs, however, prize the complex flavours of cheeses created on the mountains themselves by a handful of artisan producers. 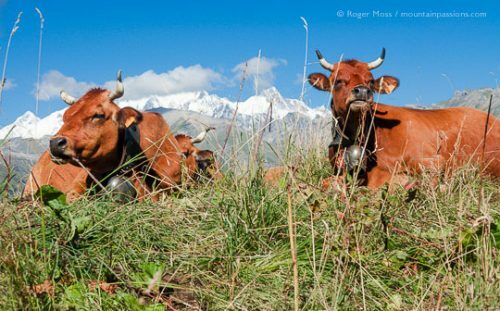 Cheeses produced between June and October in the mid-mountain pastures (or montagnettes) qualify for the official title of ‘Beaufort Alpage d’Eté’, the discernable variations in their flavours being due to the herbs and wildflowers flourishing briefly among the grass on which the cattle graze. Most highly-prized of all is ‘Beaufort Chalet d’Alpage’, produced in often remote settings above 1500m altitude. The most celebrated artisan producer of Beaufort cheese is Jean-Pierre Blanc, who was awarded a Gold Medal in Paris for his lovingly-crafted ‘Beaufort Chalet d’Alpage’. 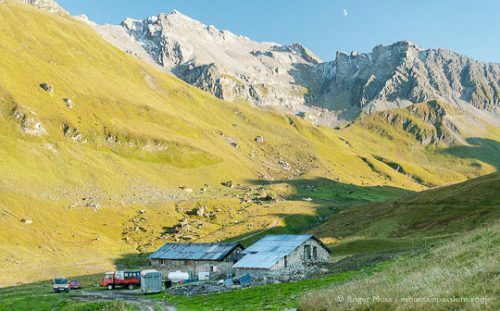 My return to the Beaufortain has been carefully timed in late-August to allow me to visit Jean-Pierre at work in the very highest of his mountain chalets – Conchette, at the head of the tiny Vallée de Treicol (alt. 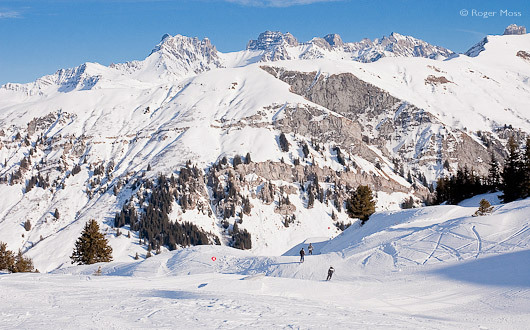 2100m). So remote is the setting that simply finding him will be a something of a challenge. 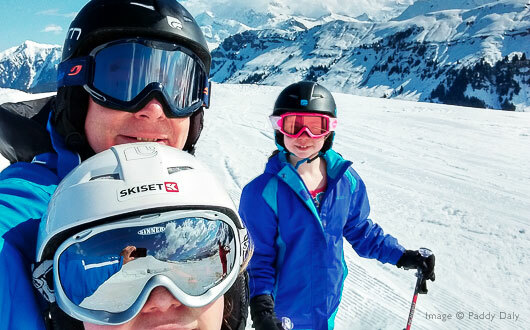 The adventure begins with a steady climb from the village of Arêches, past the cluster of large mountain chalets which alone constitute the tiny hamlet of Boudin, en-route to the Col du Pré (1703m). Beyond the Col the road descends to the southern shores of the vast turquoise-blue Lac de Roselend before eventually joining the main route from Beaufort for the rugged climb to the spectacular Cormet de Roselend. My journey, though, takes me just beyond the lake onto an inconspicuous unsurfaced track. 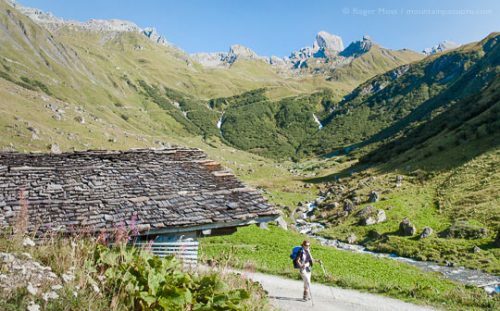 Before long I cross the first of a series of mountain streams and arrive at Treicol, a group of ancient chalets in a hauntingly wild and beautiful setting. From here the track (a deservedly popular route for walkers) becomes impassible for vehicles with low ground-clearance. 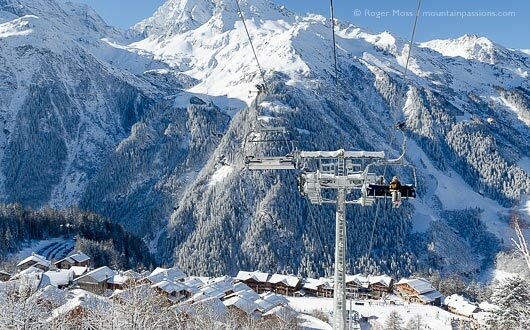 It’s also the sole means of access for anyone planning on visiting M Blanc, so I press on, climbing through difficult, uneven terrain for twenty minutes or so. Eventually a rugged-looking stone outline comes into view, set wisely in a sheltered dip in the landscape. By now the afternoon sun is low and there’s a gnawing chill in the lengthening shadows, but for now there’s no turning back. Jean-Pierre Blanc is a true Alpagist, in the sense that he continues to follow the age-old pattern of working established by his forebears centuries ago. In winter the climate at high altitudes is understandably harsh, so until the snow has melted and the grass reappears the cattle are kept safe and snug in barns on the family farm down on the sheltered floor of the valley. Cheeses produced during this period (typically between November and May) are simply termed ‘Beaufort’. When the springtime thaw begins the cattle are herded to pastures some way up the valley sides where they can enjoy the fresh spring grass (the fertile seasonal grazing areas being known as ‘Alpages’). 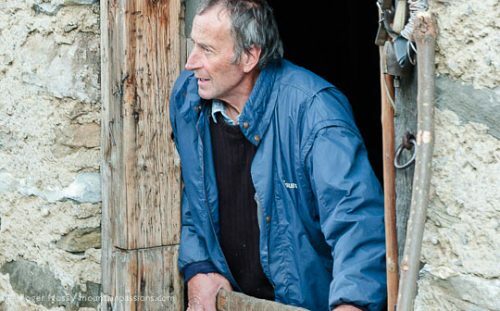 Jean-Pierre accompanies his herd, or ‘troupeau’, and from now until the autumn he will live and continue making his cheeses in a succession of robust chalet-style stone buildings owned by generations of his family. As the snow-line continues to retreat his cattle will follow the fresh new grazing ever higher up the mountainside, and Jean-Pierre will transfer to his next chalet, perpetuating the old tradition of ‘la transhumance’ which is still common in many mountain areas, including the Alps and Pyrénées. Jean-Pierre has been expecting me, and greets me with a firm handshake, an easy smile as we step into his mountain refuge. Inside, as befits a living and a working space, things are every bit as basic as I’d imagined when I’d first caught distant sight of the modest stone building. Jean-Pierre is well used to the rigours of true mountain living, and in any case has little time to enjoy the luxuries of a modern lifestyle, as I’m about to discover. First, though, we take advantage of a moment of calm and seat ourselves around a small pine table to enjoy a warming coffee and sample his renowned cheese. The intense flavour is unlike anything I’ve tasted, and I find it hard to believe that it was produced in this wild, remote setting. “The character of the cheeses is down to what the cows graze on,” explains Jean-Pierre. “Different grasses, wildflowers, exposure to sun and winds – even the soil itself, all add complexity to the flavours of the cheese”. Jean-Pierre’s 125-strong herd are a mix of the Tarine and Abondance, hardy local breeds. They’re milked twice a day at a nearby mobile milking parlour, the churns of milk then transported to Jean-Pierre’s chalet where he and his two assistants, one a trainee, start their well-rehearsed routine. During this crucial stage (known as brassage sur le feu) Jean-Pierre checks both texture and colour repeatedly until he’s satisfied that the precise moment has come for the heating to stop and the ‘cooked’ cheese removed for pressing. Doing so is a delicate exercise requiring two people, who pass a muslin cloth supported by a pliable wooden hoop beneath the heavy cheese mixture, to scoop up the contents. 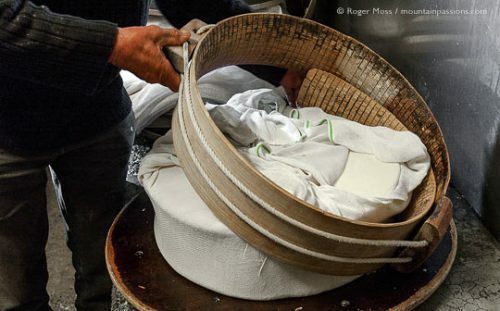 This is then hoisted on a pulley to allow the liquid to drain through the muslin, after which the remaining cheese solids are ready to be placed, still in the muslin, into timber moulds, pressed under heavy weights and allowed to solidify. 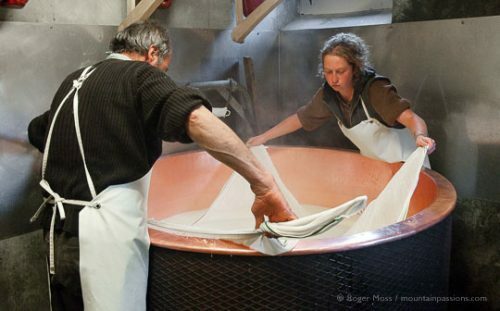 The process continues until all the solids have been removed, and between six and eight of the distinctive, convex-sided cheeses or tommes have been produced. The work isn’t over yet, however. 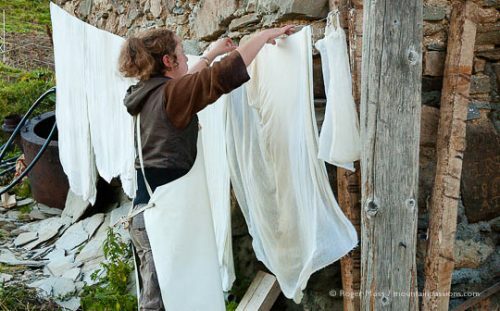 The remaining liquid is poured into milk churns (to be fed to the appreciative pigs which Jean-Pierre rears), the copper cauldron scrupulously cleaned and the muslin sheets washed and hung out to dry. Once the cheeses have hardened they can be removed from the moulds and carried out to a nearby stone building where the maturing stage or afinage can commence. 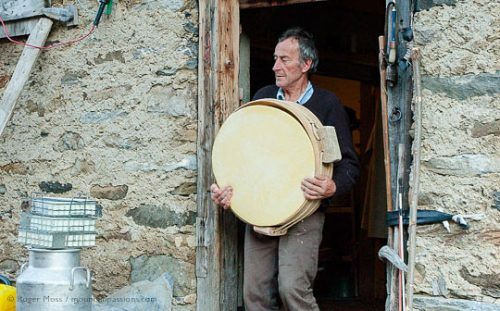 It’s physically demanding work, not least since the cheeses can weigh up to 70kg, but Jean-Pierre is well accustomed to carrying his precious creations. By now the sun has disappeared, an almost-full moon is hanging in the deepening dusk and temperatures are falling fast. It’s a long, long way back down to the valley, so I say goodbye to Jean-Pierre, and leave him to enjoy the few hours until the next cheese-making begins again in the early hours of the morning. Each summer he makes around 350 cheeses, and the work is relentless, for surprisingly little has changed since his grandfather’s day. . Mobile milking parlours, moved by tractors and powered by generators, have replaced hand-milking and gas has replaced wood fires, but the process and the toughness of the work are the same. The potential rewards, though, are far greater now. 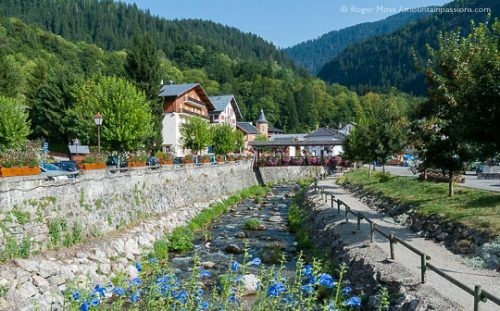 Beaufort Chalet d’Alpage cheese sells for a premium price – and Jean-Pierre can take pride in the knowledge that his name is now revered by countless cheese-lovers throughout the world who appreciate the Prince de Gruyères. This is a classic Beaufort cheese recipe, a deliciously rich cheese tart with a melt-in- the-mouth buttery pastry. Serve with a green salad and a glass of dry white Vin de Savoie for a perfect light lunch. Sieve the flour into a large bowl, add a pinch of salt. Cut the butter into small pieces and add to the flour. Rub together with your fingertips until the mixture resembles fine breadcrumbs. Add a dessert spoon of water at a time, kneading the mixture until it comes together in a soft dough. Alternatively, put the dry ingredients into a food processor, whiz to breadcrumbs then add two or three dessert spoons of cold water until it forms a ball of dough. Wrap in cling film and refrigerate while preparing the filling. In a bowl, whisk the crème fraîche with the eggs and milk. Season with salt and pepper, grate a little nutmeg, add the grated Beaufort and mix well. Roll out the pastry dough and line a buttered flan tin – one with a removable base is easiest. Prick the bottom with a fork. Pour in the filling and put in a hot oven for 30 – 35 minutes. Remove the flan from the tin and serve hot. Beaufort cheese makes a beautifully tasty soufflé. You can vary the recipe by adding girolle mushrooms or steamed broccoli to the sauce before folding in the egg whites. Preheat the oven to 220°C (200°C fan oven). Prepare a soufflé dish by greasing with butter then lightly flouring the inside. Prepare a Béchamel sauce: melt the butter in a saucepan, add the flour, salt, pepper and nutmeg. Beat the mixture together to form a roux then gradually add the milk. Stir constantly over a low heat until you have a smooth sauce. Mix in the grated cheese and remove from the heat. Separate the eggs and put the whites into a clean bowl. Add the yolks to the sauce and mix well. Whisk the egg whites until they are stiff. Fold them gently into the sauce, keeping in as much air as possible. Pour the mixture into the soufflé dish and cook for 30 minutes (don’t open the oven door during cooking or the soufflé will drop). Serve immediately. purchases: 7am – 9.30am and 5pm-7pm. There is limited parking at Treicol, about an hour’s walk from Conchette. You must telephone before you go: +33(0)6 87 70 39 90 or +33(0)4 79 38 13 03. Visit the useful website Fromage-Beaufort.com for full details about where you can visit producers, buy Beaufort cheese and lots more. Situated in the heart of Beaufort, the dairy opens its doors to visitors who wish to see the production process and learn more about Beaufort cheese. The on-site shop sells the cheese at unbeatable prices.